The Supreme Court on Thursday took strong exception to the Sahara Group allegedly obstructing the auctioning process of Aamby Valley and warned that anybody indulging in such an act would be held liable for contempt and "sent to jail". "If any impediment is caused in the auctioning process by anyone, he shall be liable of contempt of this court and sent to jail," the bench, also comprising Justices Ranjan Gogoi and A K Sikri, said. The punishment for contempt is up to six months of simple imprisonment. Later however, the apex court clarified that it was not initiating any contempt action at this stage. Regarding Sebi's allegation that the police has taken custody of the property due to which no bidder was willing to take part in the auction process, the bench directed the Director General of Police, Maharashtra, to see that the property is handed over to the Bombay high court's official liquidator within 48 hours. "You go ahead with the auction," the bench said. Senior advocate Arvind Datar, appearing for Securities and Exchange Board of India (Sebi), told the bench that the September 28 communication, addressed by the group to the Pune police regarding law and order situation at Aamby valley, has stalled the ongoing auction process. Sebi also said the letter was also sent to the additional chief secretary and no bidder was coming forward to bid for the property as the police, while taking note of the letter, has taken its custody. Meanwhile, senior advocate Mukul Rohatgi, representing the group, objected to these submissions, saying "completely wrong statements are made to prejudice the court". "No bidder has come...I (group) am not standing in the way. I have not halted anything and have not given property to the police," he said. However, the bench asked the official liquidator to go ahead with the auctioning process under the direct supervision of the company judge. It also said the official liquidator shall take guidance from Justice A S Oka, sitting judge of the Bombay high court, in the matter. The bench said Justice Oka and the company judge shall work in harmony so that the auctioning process goes on smoothly. The top court was hearing the Sebi's plea seeking contempt action against the Sahara group for allegedly obstructing the auctioning process of Aamby Valley. 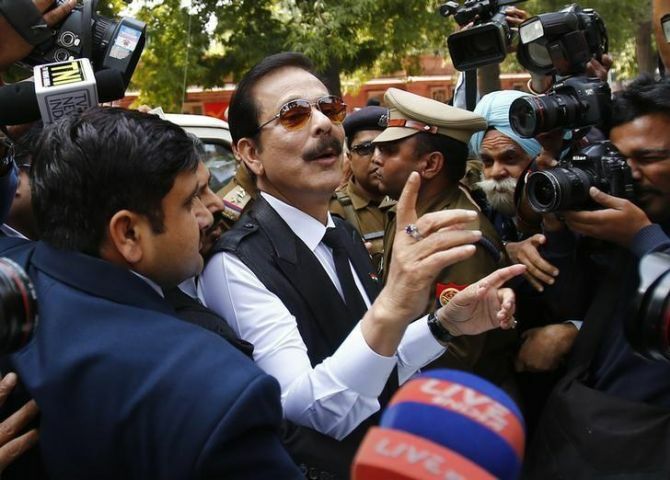 In its plea, the Sebi has alleged "wilful and deliberate attempt" on Sahara's part "by adopting a subterfuge to cause interference with the administration of justice, especially in a court directed and monitored auction sale of the Aamby Valley property under various orders of the apex court." On August 10, the apex court had rejected Sahara chief Subrata Roy's plea to put on hold the auction process. Sahara refund account by September 7, then it may pass an appropriate order. The Sahara Group had earlier sought 18 months time to repay around Rs 9,000 crore (Rs 90 billion) balance of the principal amount of Rs 24,000 crore (Rs 240 billion). Besides Roy, two other directors -- Ravi Shankar Dubey and Ashok Roy Choudhary -- were arrested for failure of the group's two companies -- Sahara India Real Estate Corporation (SIRECL) and Sahara Housing Investment Corp Ltd (SHICL) – to comply with the court's August 31, 2012 order to return Rs 24,000 crore to their investors. Finally Modi gets some good news!